We are engaged in providing Electromagnetic Chuck UL-722 Series. The product is made from best quality raw components and material, which helps in increasing its durability. The Electromagnetic Chuck is durable. The chuck, provided by us, is made available as per the requirements of the clients. Work holding device for surface grinding machines. Each pole is having separate coil, as such very strong & even magnetic flux is generated. Accuracy as per IS : 8710 - 1978. Magnetic pull is 30-50% more then IS specification. Fine Pitch (1 + 0.5) makes it suitable to hold very thin & small jobs. Mag - D - Mag with variable control unit allows to neutralize the residual magnetism precisely , using a microprocessor based control circuitry. Variable supply to vary power which helps in alignment & removing of warpages of thin jobs. Chuck is tested for Slippering force, Waterproof test, Temperature rise test, Electrical & Demagnetizing tests. Good quality & standard electrical accessories. We also manufacture Special chucks to suit individual requirement. Sr. No.Â Cat No. 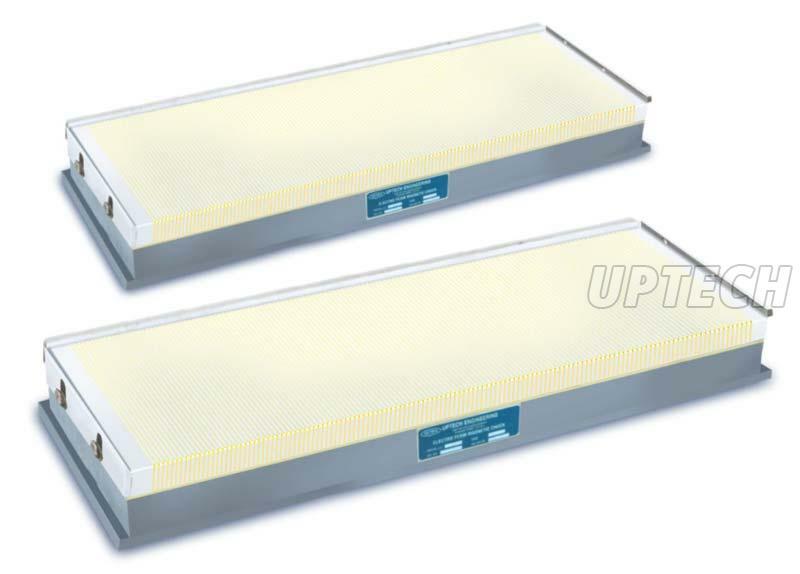 Size (mm) Pole Gap (mm) 1 UL-72201 450 L x 150 W x 100 H 1.5 2 UL-72202 450 Lx 200 W x 100 H 1.5 3 UL-72203 500 Lx 200 W x 100 H 1.5 4 UL-72204 600 Lx 250 W x 100 H 1.5 5 UL-72205 750 Lx 250 W x 100 H 1.5 15A. "Ultra" Mag D- Mag with Variable Control Unit Â 2 Amp. 15B. "Ultra" Mag D- Mag with Variable Control Unit & Battery Back Up (20min) 2 Amp.